Hades was the Greek God of the Underworld, the ruler of the dead. Hades was an important God, because he incorporated the concept of the “other world” and sometimes the idea of the good and the evil. Hades in Greek means the Unseen. Although the name Hades was the name of the God himself, it soon became synonymous to the place where the dead people would go, so Hades soon became synonymous of the Underworld. Hades was swallowed by Cronus along with the rest of his siblings. 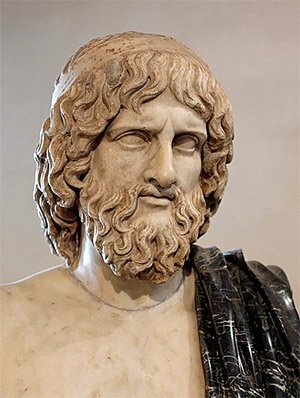 Zeus was the only one who managed to escape, and when he reached adulthood, Zeus managed to force his father to disgorge his brothers and sisters. The six children joined forces with other deities and started the Titanomachy against Cronus and the other Titans, in which the latter lost. The Gods took their place among the Olympus Pantheon, and drew lots to see who would rule the various parts of the world. Hades became, thus, the God of the Underworld. The Greek myths associated with this draw suggest that Hades was pretty dissatisfied with his luck, but since he could not do otherwise, he left for the Underworld. Hades seldom left the Underworld. Even if he did, few would know about it, because he had created a helmet that made him invisible. He sat on an ebony throne holding a bird tipped scepter. He always chose to sit there when he was supposed to meet a newcomer, because he knew how fearsome and imposing he seemed on it. Since he lived in the darkness, Hades developed a rather morbid personality, which was not much liked by the other Gods. Hades made a dark chariot, drawn by four dark black horses; its impressive and loathed sight would scare anyone in his path. Since he lived in the darkness, Hades developed a rather morbid personality, which was not much liked by the other Gods or humans, especially since Hades seemed to enjoy being feared. It is not surprising that the Underworld was his realm and shrine, but almost no temples were built to Hades on Earth. Hades decided to appoint a guardian for the Underworld. This guardian was Cerberus, the three headed dog that would tear apart anyone that was not supposed to be in the Underworld. Cerberus was one of the mythological creatures associated with the God of the Dead, along with the cypress tree. A common attribute to the God was Narcissus and the Key of Hades, which implied that he was guarding carefully anyone who would enter his domains and that no one could escape without his permission. Although Hades was the God of the Underworld and the Dead, he was not the God of Death, as many people falsely believe. Thanatos was the God of Death and brother of Hypnos. Hades was ruling the Underworld and the souls that resided in it, but he was not choosing who would have such a fate. People tend to associate him with death, because he was so fearsome, but in fact, Hades was one of the most just Gods of the Dodecatheon. Hades was basically a way for the Greeks to come to terms with the idea of Death and Afterlife. He was more like the continuation of life, “housing” in a way the souls once the bodies died. Hades was married to Persephone, daughter of Goddess Demeter. Their love story is described in the myth of Hades and Persephone. Hades was associated in the Roman mythology with Pluto and Orcus, and became a very important term in many religions.The Roman religion associated Hades with the Purgatory. Since the name Hades was synonymous to the Underworld itself, the Christians used the term Hades to describe a place like hell, where the souls fallen from grace would go. In the Book of the Revelation, Hades and Death are directly associated, while the New Testament uses the word hades to refer to the temporary abode of the dead. I love your writing story’s is amazing….May the Gods give you what you want Katerinaki..
Keep this blog updated guys it’s awesome! I have recommended to many friends who like Greek Mythology, don’t let it die please! Greetings from Carolina! I’m bored to death at work so I decided to browse your website on my iphone during lunch break. I enjoy the information you provide here and can’t wait to take a look when I get home. I’m shocked at how fast your blog loaded on my phone .. I’m not even using WIFI, just 3G .. Anyhow, excellent blog! Hades is a very cool guy, but how did his dad swallow him and then he still be God of the Underworld? I just dont understand that, its very confusing and i really wanna find out how that worked out because i really did not get it???? Can you explain to me how it worked out??? Because it said Hades was swallowed by Cronus (his dad) along with the rest of his siblings. Now i got another question how did him and his siblings have kids if they were swallowed??? Well Cronus was also a giant and thats how he swallowed them whole.